Description: Intra-Structure is an on-going, site specific, audio visual performance piece that integrates the sonic and visual components of a given performance space as the fundamental source material for the performance itself. 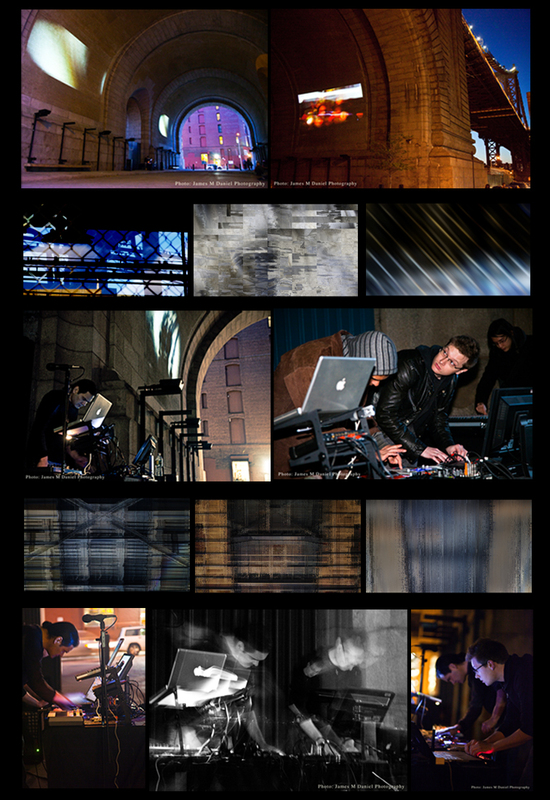 The first performance of Intra-Structure was Under the Arch of the Manhattan Bridge in Dumbo, Brooklyn. Artist Statement: Intra-Structure is a lense and microphone aimed at a disintegrated continuum: A dissection and re-synthesis of perception. Existing environments both natural and man-made captured then re-generated with voltage and light. A non-linear palimpsest amplified and projected with the accuracy and ambiguity of dream state; then sifted and analyzed as data not limited by strict rules of logic, time or space.